The view from Vermont’s Mount Philo with Lake Champlain and the Adirondack Mountains in the distance.Courtesy of Shutterstock. These seven words, quietly slipped into an appropriations bill by Vermont’s U.S. Senator Patrick Leahy in 1998, briefly elevated the national status of a picturesque but little-known body of water that nestles between New York and Vermont. A short-lived, but surprisingly fierce, regional dispute ensued about the essential question: What makes a lake great? Lake Champlain provides one way to answer that question. The lake forms part of the border between Vermont and New York, and extends northward into Quebec. It stretches for over 100 miles north to south, but with a maximum width of only 12 miles. The lake and environs played a key role in the American Revolution, and today it drives a good deal of the local economy, drawing tourists and businesses to this remote rural region. So it’s no wonder that locals consider it a great lake—but is it a Great Lake? It’s complicated. Champlain does share some features with the five Great Lakes—Ontario, Erie, Huron, Michigan, and Superior. Lake Champlain and the Great Lakes are within the Laurentian Mixed Forest Ecoregion, meaning that the climate, topography, forest type, and soil type are similar. And like the Great Lakes, Champlain is partially a relic of the last Ice Age. The great ice sheets that covered much of North America 18,000 years ago carved out the depressions that would become these lakes. As the glaciers retreated, meltwater to their south filled the basins, while the ice prevented a northward flow to the ocean. At one point the Great Lakes and Lake Champlain discharged to the Atlantic Ocean via the Hudson River. The retreat of the ice sheets uncovered today’s shared northern outflow via the St. Lawrence River, which divides northern New York state from southern Canada. But by almost all geographic measures, the idea of Champlain as a Great Lake is ludicrous. Champlain is about half the length of the shortest of the Great Lakes. One would need to row across Lake Champlain and back twice to equal the distance it would take to cross Lake Ontario, the narrowest of the Great Lakes. By surface area, almost 17 Champlains would fit into Ontario, the smallest of the Great Lakes. By water volume, almost 19 Champlains would fit into the second-smallest of the Great Lakes, Lake Erie, which contains less water than Ontario. There are bays on the Great Lakes that are larger than Lake Champlain: Georgian Bay on Lake Huron, and Green Bay on Lake Michigan. Only in depth can Lake Champlain at least stake a claim of being a Great Lakes peer. Lake Champlain is deeper than Lake Erie, though Lake Superior, the deepest of the Great Lakes, is more than three times deeper. Champlain offers a mix of open water, secluded bays, steep cliffs, and teeming marshes. The Adirondack High Peaks, New York’s tallest mountains, loom over the western shore, while the Green Mountains of Vermont mark the eastern horizon. Much of the shoreline is still undeveloped with cedar trees leaning out from limestone bluffs. Natural sand beaches develop near the mouths of the Winooski, Ausable, Saranac, and Lamoille Rivers. More than 70 islands dot the lake. Fossils from the earliest known reefs lie exposed on the surficial bedrock of the larger islands. Burlington, Vermont’s largest city, sweeps upward from the eastern shore overlooking the widest expanse of water. From Burlington, a paved bike path hugs the water, culminating in a magnificent three-mile stretch over an abandoned railroad causeway crossing the lake. Supporters of raising Lake Champlain’s stature point to its commonalities with the Great Lakes—and its special place in early American history. In 1609, the Frenchman Samuel de Champlain became the first European to set eyes on the lake. Over the next 150 years, the lake provided a water corridor between Quebec City and New York, thus serving as a central trading route between the French to the north and the Dutch and later English to the south. The rights to control the waterbody were often contested between the European and colonial powers. Fort Ticonderoga, an 18th-century star-shaped structure overlooking a narrow point near the southern end of the lake, epitomizes the conflicts. Within a period of 18 years, control of the fort vacillated five times between three different countries: France, England (twice), and the United States (twice). In 1775, in one of the Revolutionary War’s first engagements, the Vermont militia—the so-called Green Mountain Boys—took control of the fort without firing a shot. Following this capture, the Americans anticipated a British counterattack. Benedict Arnold, at this point still loyal to the rebelling colonists, had commandeered a trading schooner owned by a British loyalist in what is now Whitehall, New York, making Whitehall the self-proclaimed birthplace of the American Navy. This boat, along with another captured by Arnold’s troops, was soon joined by 13 more ships built at Ticonderoga during the summer of 1776. When the British fleet arrived at the north end of the lake, it set out to find the Americans, and eventually encountered Arnold’s armada hidden between Valcour Island and the shore. A fierce battle ensued, with the Americans vastly out-gunned. At the end of the first day, it was clear that the American fleet would not withstand the onslaught. But Arnold ordered the boats to be rowed past the British fleet with muffled oars under cover of darkness. To his great chagrin, British General Guy Carleton awoke the next morning to find his enemy had escaped. He gave chase through the early morning fog, at one point firing upon what he thought was a disabled colonial ship. As the fog cleared, however, he learned that he had been firing upon a small, rocky island, which to this day bears the name Carleton’s Prize. Meanwhile, Arnold escaped to the south, eventually scuttling his remaining ships on the eastern side of the lake in what is now called Arnold’s Bay. Though Arnold lost the fight, the British fleet was sufficiently damaged for them to return to Montreal for the winter and give the colonies an extra winter to prepare and court allies. The lesser-known Battle of Plattsburgh occurred on the lake in 1814 and was a simultaneous land-and-sea conflict. Anticipating an attack, Lieutenant Thomas Macdonough constructed three gunboats, adding to the one they already had. The American and British fleets met in Plattsburgh Bay in September, with Macdonough’s fleet victorious. Without naval support, the British soon retreated from the land battle as well. The American victory forestalled British claims to Lake Champlain and the Great Lakes in the peace negotiations which ended the War of 1812 in December 1814. By almost all geographic measures, the idea of Champlain as a Great Lake is ludicrous. Champlain is about half the length of the shortest of the Great Lakes. Almost two centuries later, Lake Champlain was at the center of a less violent, but still passionate, battle. The 1998 legislative brouhaha about whether to classify it as one of the Great Lakes wasn’t about dimensions or ecosystems or relative historical importance. It was about research money. Since 1966, all states and territories of the United States with a border on an ocean or one of the Great Lakes have been eligible to host a Sea Grant program, a program within the U.S. Department of Commerce that provides federal funding for research and outreach about coastal and aquatic resources. 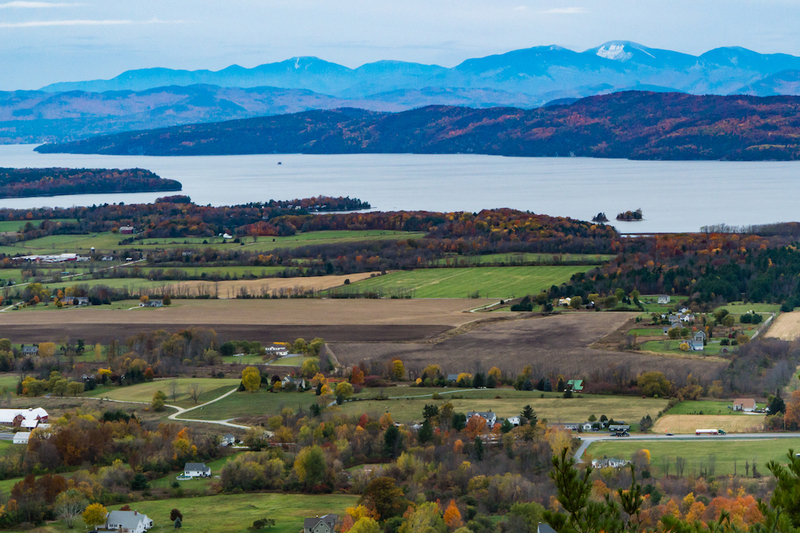 By declaring Lake Champlain to be a Great Lake, Senator Patrick Leahy of Vermont saw an opportunity to make his land-locked state eligible to host a Sea Grant office. The minor edit to the appropriations bill escaped notice and the bill passed on a voice vote. President Bill Clinton signed it on March 7, 1998. Once the inclusion became publicly known, Midwesterners were not pleased. “Lake Champlain is about as big as your little finger. It doesn’t stack up with the other lakes,” said a Michigan representative. An Ohio representative scoffed, “If Lake Champlain ends up as a Great Lake, I propose we rename it ‘Lake Plain Sham’.” The Green Bay Press in Wisconsin labelled Senator Leahy the Fourth Stooge for adding a sixth Great Lake. The outrage centered on state pride associated with being home to a Great Lake, not with money or resources—the original motivation for the change. Therefore, politicians quickly found a resolution that left everyone happy. The offensive phrase calling Lake Champlain a Great Lake was struck, but Vermont’s eligibility for a Sea Grant office remained. Lake Champlain lost its status but retained its funding. The addition of Lake Champlain to Sea Grant has strengthened the program overall. Lake Champlain serves as a microcosm of the Great Lakes for researchers. Experiments have been conducted to identify impediments to lake trout reproduction, enhance management of parasitic sea lamprey, and detect sources of microplastics, which contaminate the environment and accumulate in the bodies of fish and other animals. These same challenges face the Great Lakes, but research can often be conducted more efficiently on the smaller Champlain. Champlain has lost the title of Great Lake. It has not lost its place in the history of the founding of our nation. It has not lost its utility as a laboratory for cutting-edge research. And it has not lost the affection of those who live or visit the region. The lake may not be a Great Lake, but it will ever be great. Mike Winslow has spent over 15 years contemplating the wonder and beauty of Lake Champlain. He is the author of Lake Champlain: A Natural History.